Divides a Face (both edges in the wires, by splitting curves and pcurves, and the face itself, by splitting supporting surface) according to splitting criteria. The domain of the face to divide is defined by the PCurves of the wires on the Face. all the PCurves are supposed to be defined (in the parametric space of the supporting surface). The result is available after the call to the Build method. It is a Shell containing all the resulting Faces. 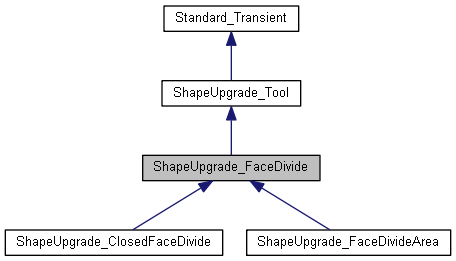 All the modifications made during splitting are recorded in the external context (ShapeBuild_ReShape). Returns the tool for splitting surfaces. This tool must be already initialized. Returns the tool for dividing edges on Face. This tool must be already initialized. Performs splitting and computes the resulting shell The context is used to keep track of former splittings in order to keep sharings. It is updated according to modifications made. Gives the resulting Shell, or Face, or Null shape if not done. Sets the tool for splitting surfaces. Sets the tool for dividing edges on Face. Performs splitting of curves of all the edges in the shape and divides these edges. Queries the status of last call to Perform OK : no splitting was done (or no call to Perform) DONE1: some edges were splitted DONE2: surface was splitted DONE3: surface was modified without splitting FAIL1: some fails encountered during splitting wires FAIL2: face cannot be splitted.